It must be this wet and cold autumn weather that’s making me think of nice cosy sheds and how essential they are for a gardener. You need somewhere to keep all your tools safely away from the rain, the kids and anyone who might take them away! A shed provides a place to keep your allotment essentials too including your bags of soil conditioners, plant pots, seed trays, tools and slug pellets. It’s a place to lock so that kids don’t mess with sharp tools or dangerous weedkillers or pesticides. It can also be a place to retreat to when the weather is suddenly bad. On our allotment site there’s a limit on shed size due to some planning rules that were put in place when the site was opened. You can buy this great shed – 8′ x 6′ (2.37×1.79m) Windsor Overlap Double Door Apex – for only £197.99 Including VAT & Delivery. This is a great size shed, perhaps suited best to a garden where you need lots of storage for the kids bikes, or a lawnmower; or maybe on the allotment where you need to store a wheel barrow as well. There’s almost certainly room for a chair in there too. Great value shed offering good space and a great price. If you need a smaller shed they have a good range and you can sort by type of shed and size making it easy to find just what you’re looking for. Their delivery service is free too and there’s even an installation service available too. If you’ve got room for a bigger shed, always buy one as big as possible as you will find it fills itself very easily! Every garden should have a shed! They’re useful for putting gardening tools in, hiding the lawnmower away, putting the garden furniture in over winter and generally keeping the garden clutter free. You can even keep the kids bikes in there if there’s room! 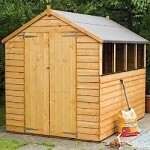 There’s a massive range of sheds available to fit all sizes of garden and spaces. They even do corner sheds now to make it even easier to find a shed that fits your garden. One of the best places to shop for sheds is a shed specialist called Shedstore. They really are the bees knees for sheds with the biggest range I’ve seen online and you’re supporting British manufacturing by buying from them too. They’ve got 6X4 sheds which is the only size allowed on our allotments for only £159 which is a great deal and with free delivery too it’s fantastic value! buildings – all at discount prices! log cabins, children’s playhouses, greenhouses and much more. We offer free UK delivery, installation services, brochures and advice.